Nothing tops being entrusted with a facility housing 380 residents to do a surprise holiday dinner for the less fortunate. Thank you, for allowing us to do what we do. It takes a village and we are the VILLAGE. Thank you to all of our sponsors, donors, chiefs; it’s because of you, that we were able to make a difference. We meet the people where they are…PERIOD! 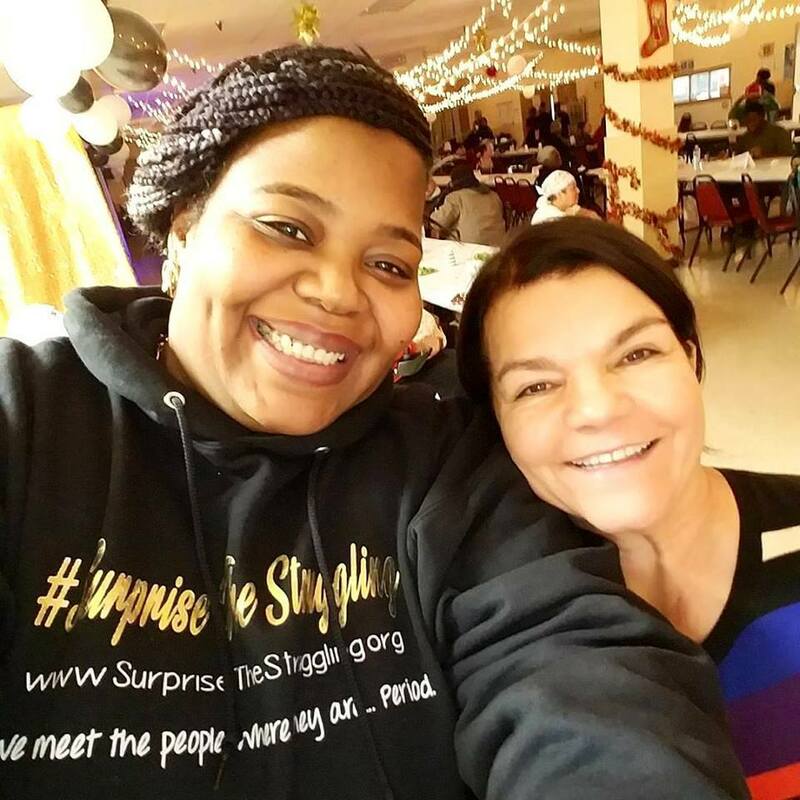 With every ounce of sincerity, thank you all from the bottom of my heart for making this year’s Gift Giving Extravaganza, the most amazing day in the history of #SurpriseTheStruggling™ (A Hashtag Movement for Homeless Women.) From my key Chief Ambassadors, Thamicha Isaac, Ebony C Johnson, and Charlene Stewart for breathing into me when I was second-guessing. My event planner, Vanessa E-El, The Event Strategist—who delivers every year faithfully! My cake supplier CAKES BY COLEY. I adore you, Coco! To my DJ, Ron Cee of Exodus Entertainment. I love you! To my CLO, Ruthe McDonald who makes it all happen. My photo lady, Delilah Peach Williams, love you, babe! To the Ladies and Gentlemen who cooked/served/delivered from SPBC, POYED by Velvette, Robin Devonish, Aja Webster Barton, Paulette Bailey, Cynthia Juhans, and my brother & the Doc, Bryant Pearson; thank you! To the director of Starbright Family Residence, Ms. R, for entrusting us with your residents! 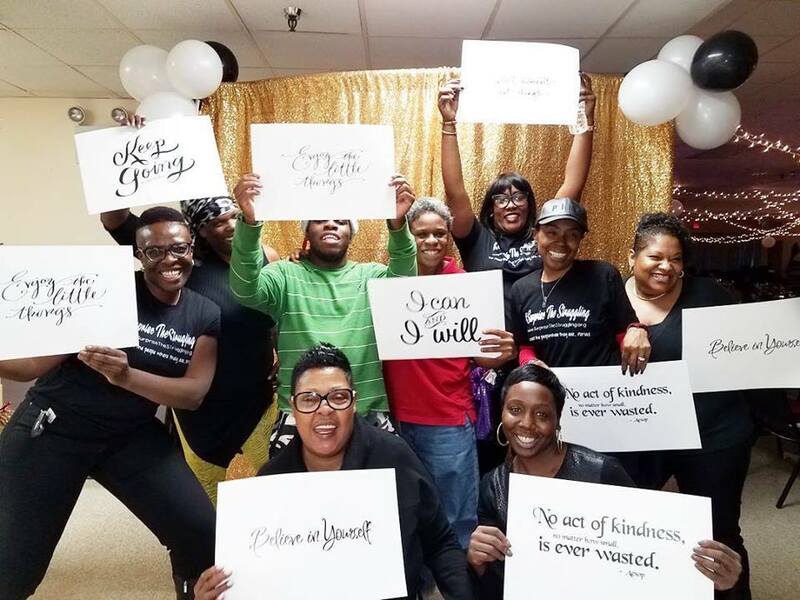 Also, to my sister Wanda Edwards, to my love, Essence Bembry, and her boys, APWorld & Fear the Fro, Atlanta Hawks, for donating the bags and shirts. To my Accountability partner, Eloquent Essentials for sponsoring gifts. To Dr. Natacha Chloe and my day one ambassador, Keisha Christie, for sponsoring always! Althea Webber Bates, Shawn Headley, Iesha Sekou, and EVERYONE who sent a monetary donation…I LOVE YOU! Tanisha Smith Franks, Luck Da Barber 💜, my children, my family, and my GOD—we did it!!!! ANYTHING IS POSSIBLE WITH A TEAM! Looking forward to an even greater 2018!!!! LET’S DO THIS!!! We meet the people where they are…PERIOD.